The San Francisco Board of Supervisors voted unanimously Tuesday to allow a measure on the November ballot that would restore funding from the city's hotel room tax for arts and culture activities in the city. In a press release, supporters of the measure said the "Hotel Tax Allocations Initiative Ordinance" would "reconnect funding for arts and culture in San Francisco to a portion of the city’s Hotel Tax and its projected growth without raising taxes or taking away from other city services." The hotel tax is a 14 percent tax levied on hotel stays. The tax was originally created in 1961 to support the city’s arts industries, and the construction and operation of convention facilities. In the early 2000s, the city amended the allocations for the arts as part of the annual budget process, reducing funding gradually and ultimately repealing specific allocations altogether. "Unfortunately, the link between this hotel tax revenue and arts funding was broken," said Supervisor Katy Tang. "We are trying to restore the historic link between our hotel tax revenues that are dedicated to arts funding." The new measure, if passed in November, would restore 1.5 percent of the base hotel tax (that's 8% of the total 14% hotel tax) exclusively for arts funding. The remaining 12.5 percent goes into the general fund. The new measure comes in the wake of failed Proposition S in 2016. 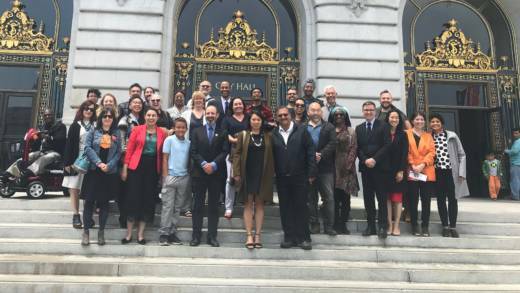 That measure brought arts and homeless organizations together in a joint bid to secure monies from the hotel tax to benefit cultural organizations and families living on the streets. It also aimed to do so without raising taxes. But the measure didn't pass. Supervisor Aaron Peskin said he generally doesn't approve of set-asides from the general fund. He was not a fan of Proposition S. But Peskin views this new measure differently, because it aims to restore the historical commitment of the city toward supporting the arts while maintaining a larger chunk of the coffers for the general fund than would have been possible under Proposition S.
"It's been a delight in the defeat of Proposition S that we could all come together and do something that did not impact the general fund to the same degree," Peskin said. Dozens of arts organizations are supporting the proposed measure. The measure would need to be approved by at least two-thirds of San Francisco voters to pass on Nov. 6.